Customer must purchase a minimum of 5 licenses at $85.00 per license. 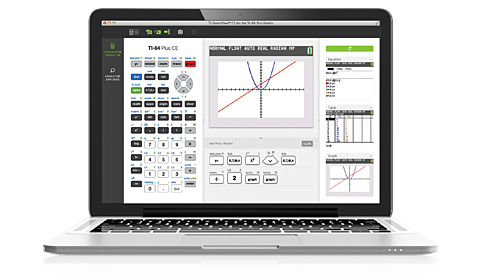 TI-SmartView™ CE software emulates the TI-84 Plus family of graphing calculators on a PC or Mac®, making it an ideal demonstration tool for leading classroom instruction of math concepts. Students can follow along easily withthekey press sequenced display. Display up to four different representations including graph, table, quation, and data list screens – simultaneously, to help students develop a deeper understanding of topics. TI-84 Plus Family Compatibility – Supports and enables switching between the color TI-84 Plus CE and the TI-84 Plus C Silver Edition or the traditional TI-84 Plus and TI-84 Plus Silver Edition. Visual Key Press – Clearly indicates each calculator entry with red display of the last key pressed. Key Press History – Allows students a clear and easy way to follow along with the teacher. Educators can copy and paste key presses into other applications to create class handouts. Screen Capture – Drag screen captures from TI-SmartView™ CE into compatible applications, such as Microsoft® Word. View3 TM Feature – Enhance comprehension by projecting up to three concept representations simultaneously with the View3 TM feature. Use Real-World Examples – Add images to illustrate math and science concepts through real-world examples.